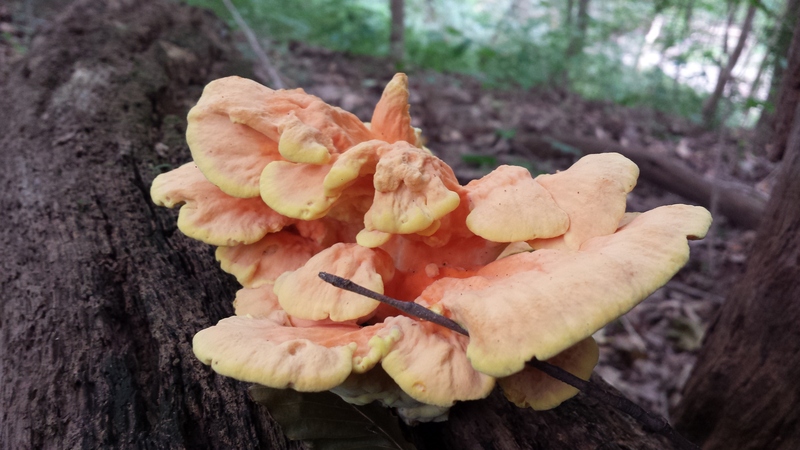 This past summer, I hunted specifically for a mushroom called “Chicken of the Woods.” In earlier years, I had found really small specimens or old specimens. 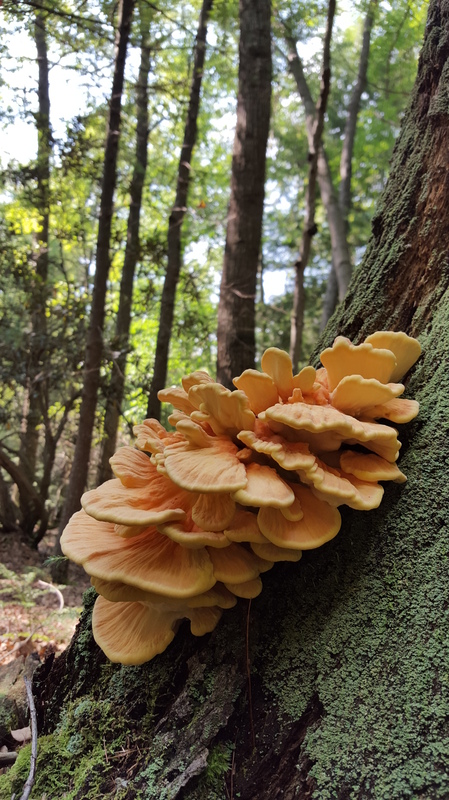 I knew that they were frequently found on oak trees, so I looked for trees that appeared dead or had already fallen down. 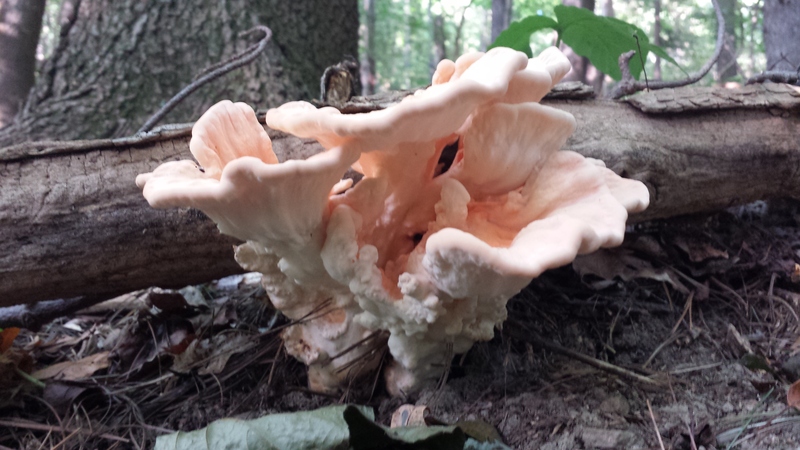 I found large quantities of this mushroom from late June to mid-September. 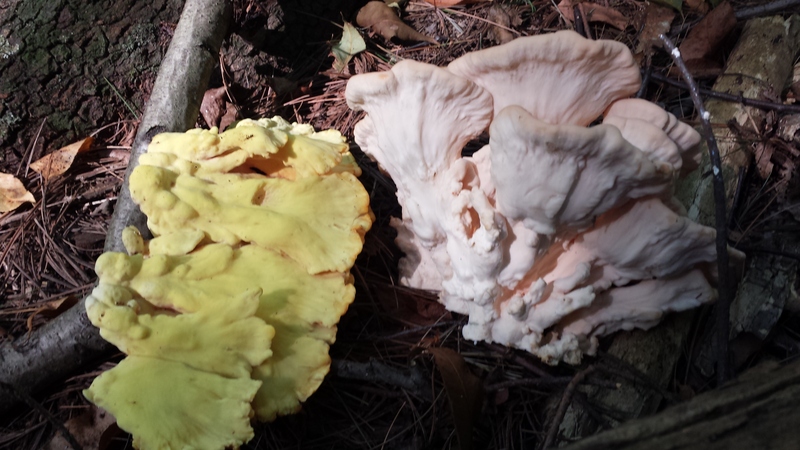 Two varieties were found in the wooded parks within an hour of my house. 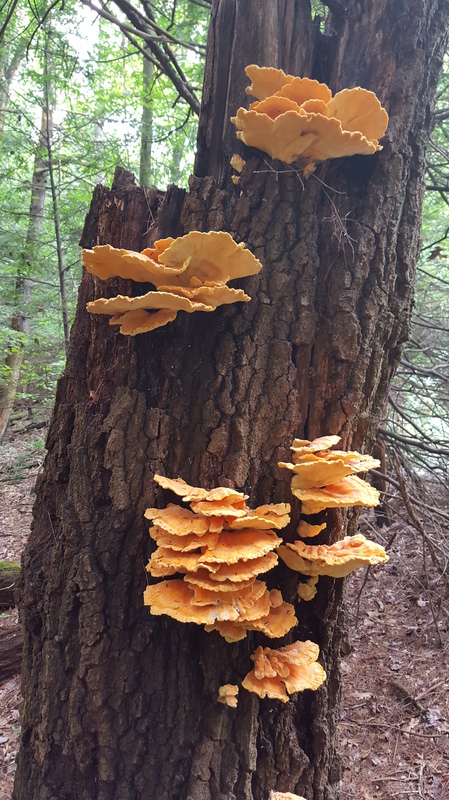 I found Laetiporus sulphureus (orange polypore with a yellow pore surface) and Laetiporus cincinnatus (orange polypore with a white pore surface). 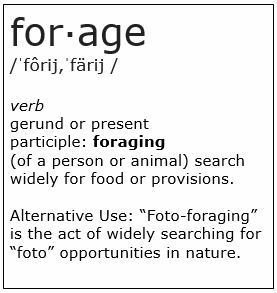 In the photos below you will notice the differences. 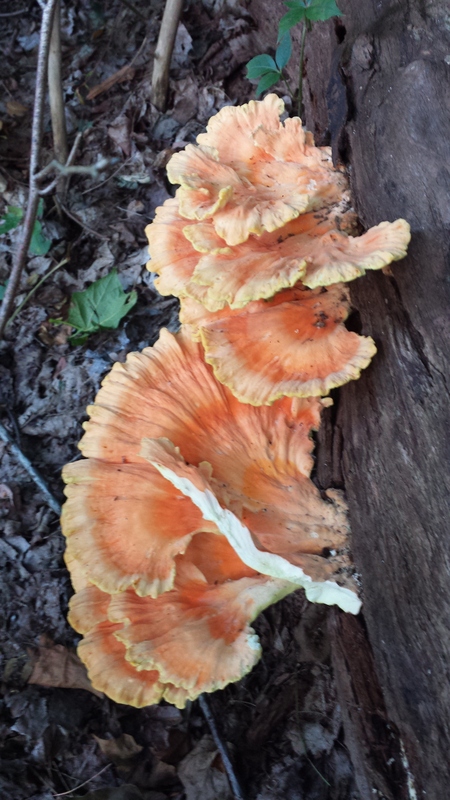 Both of these are found attached to wood. 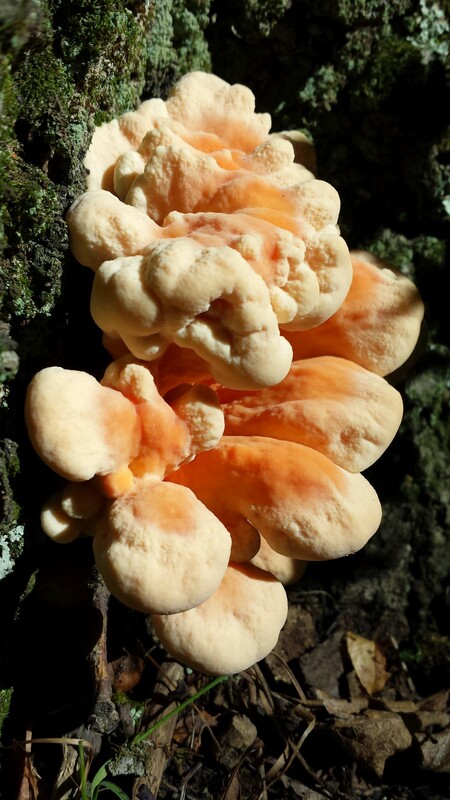 Laetiporus cincinnatus is less common and typically it grows at the base of a tree. 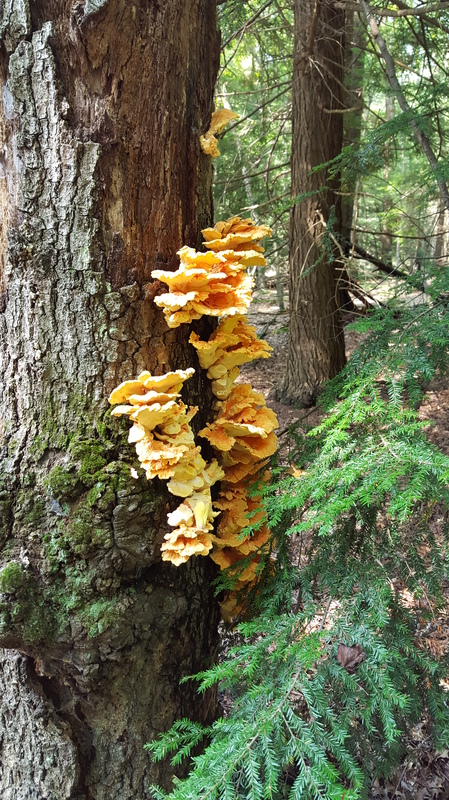 It can appear to be terrestrial but is actually attached to the roots of the tree. 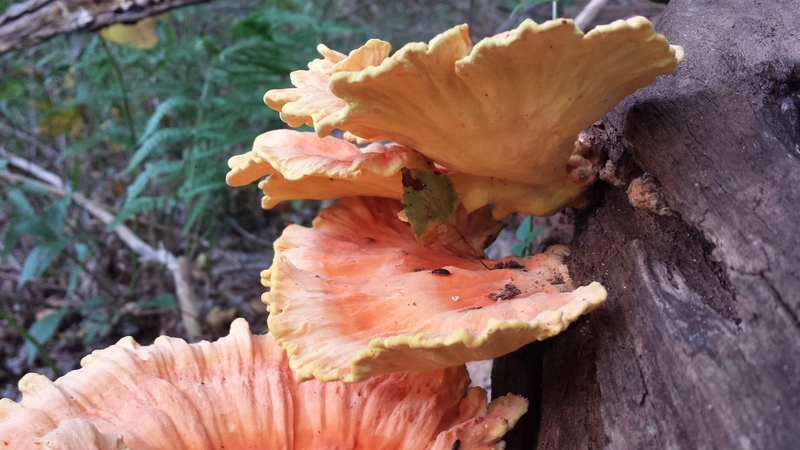 Both of these varieties are edible, but it is highly recommended to harvest them when they are young to limit the exposure to bugs. 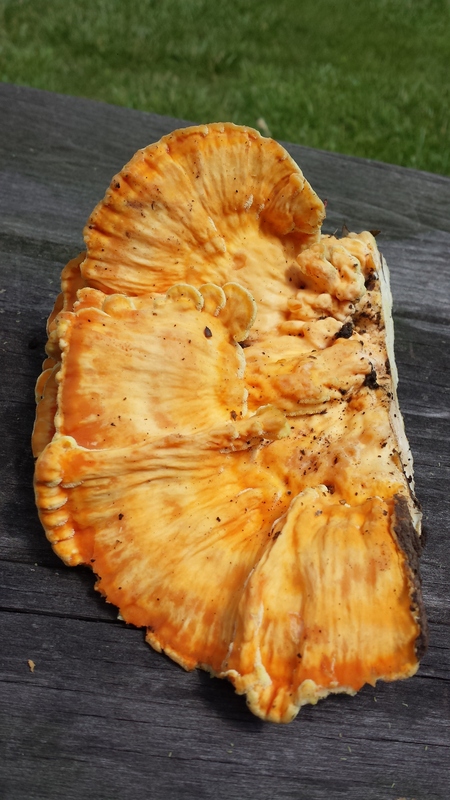 You can examine the pore surface to determine whether you should harvest them or not. 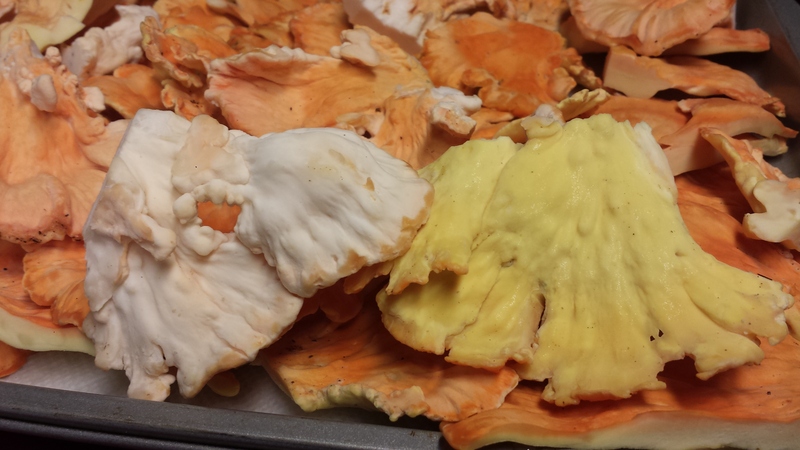 As with all edible, wild mushrooms, you need to fully cook them and it is wise to try them in small quantities. Let some time pass before eating more. There is a small population of people that are allergic to them. 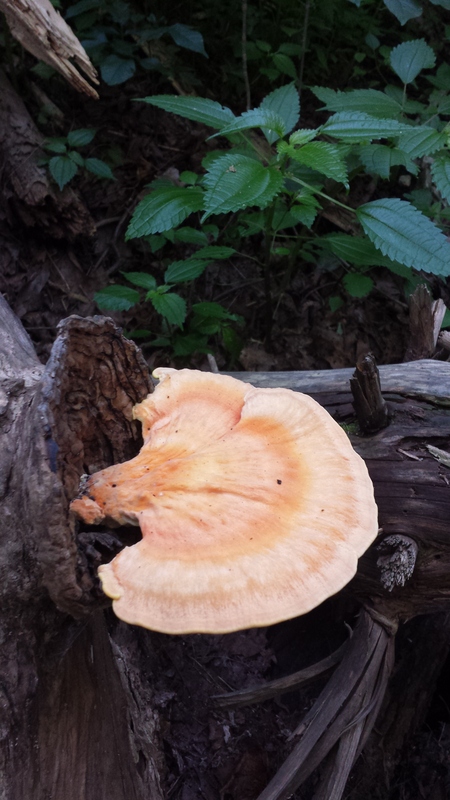 It is important to notice the type of tree that the mushroom is growing on for identification purposes. 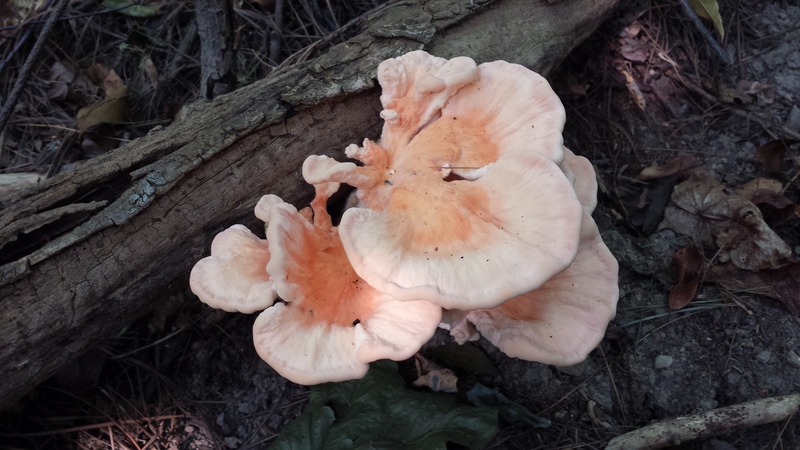 One Laetiporus species that has a much higher chance of an allergic reaction is the Laetiporus huroniensis. 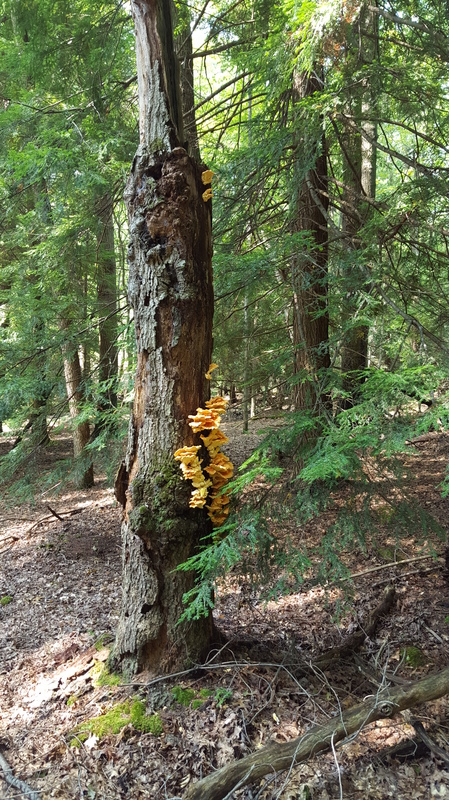 I found this mushroom growing on hemlock trees. 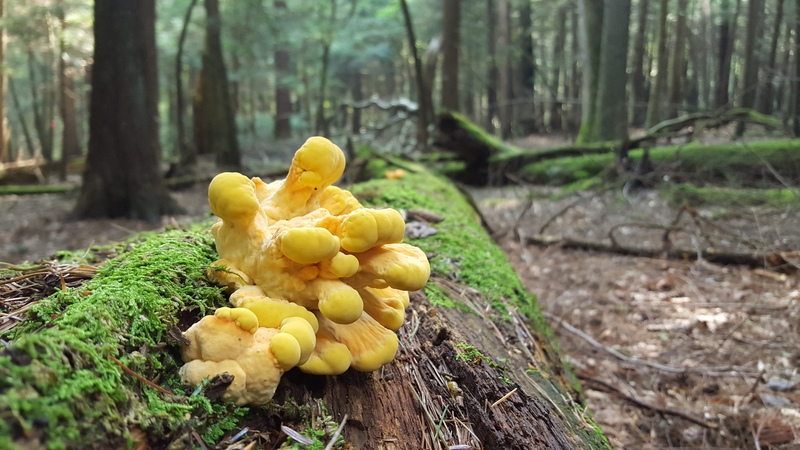 Below are some of my photos from Cook Forest State Park. 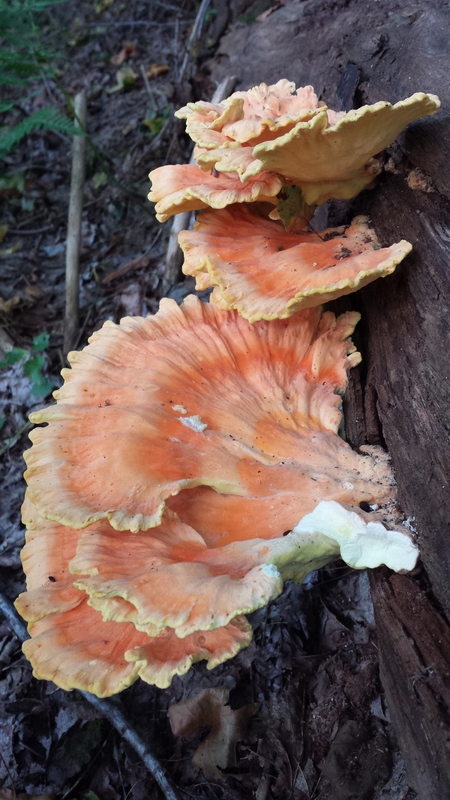 You will notice that they look just like Laetiporus sulphureus. 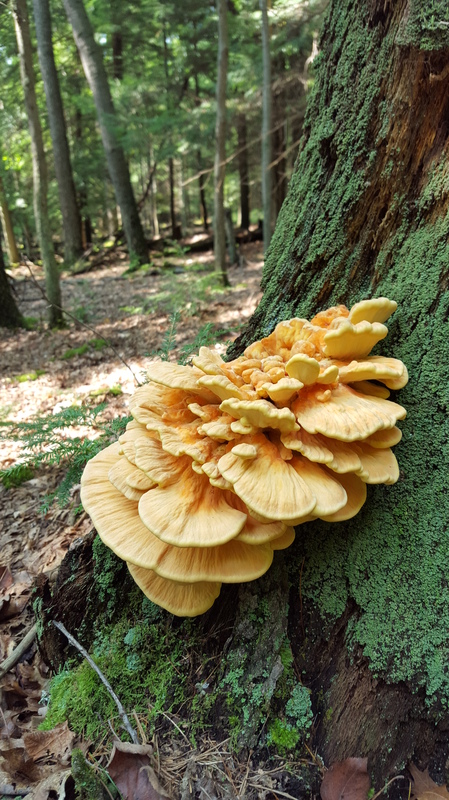 The question that everyone seems to have is, “Why is it called a Chicken of the Woods mushroom?” Almost everyone quickly follows the question with a comment like, “It probably tastes like chicken, right?” I wouldn’t say that it tastes exactly like chicken, but it does have a very mild flavor and has the texture and consistency of chicken. 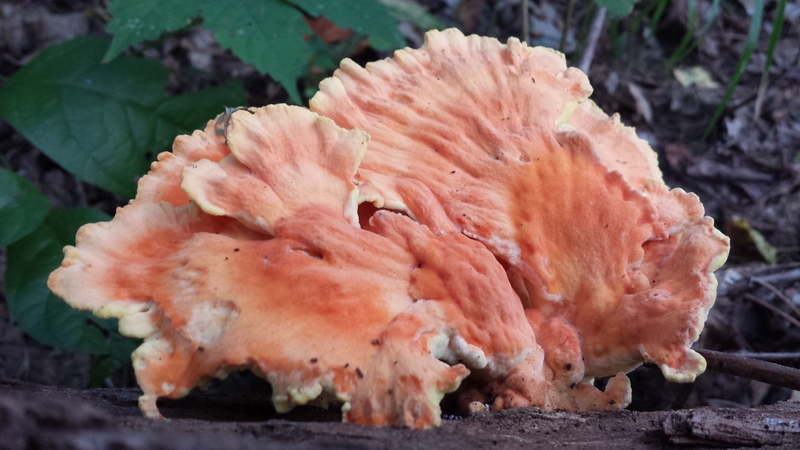 It is an excellent substitute for chicken in your recipes. 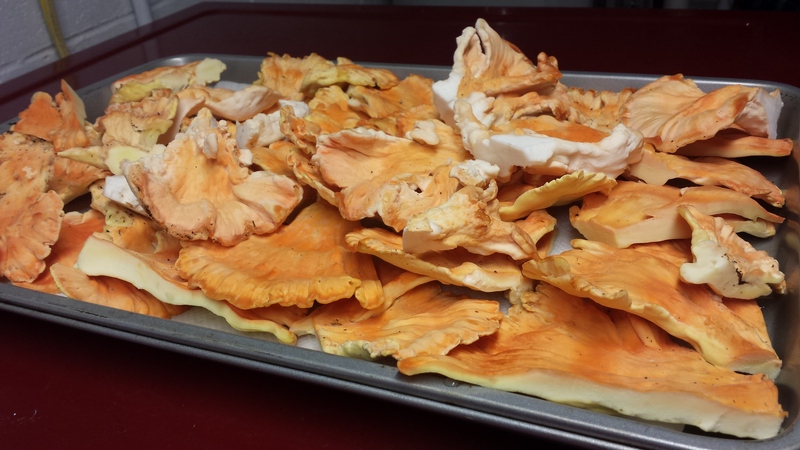 While it tastes good plain, it goes great with sauces and absorbs their flavors. 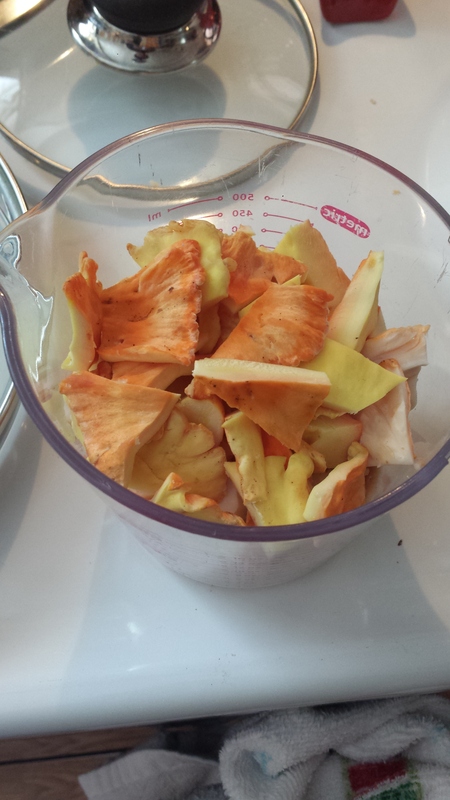 My first batch of Chicken of the Woods produced 12 cups of diced mushrooms. 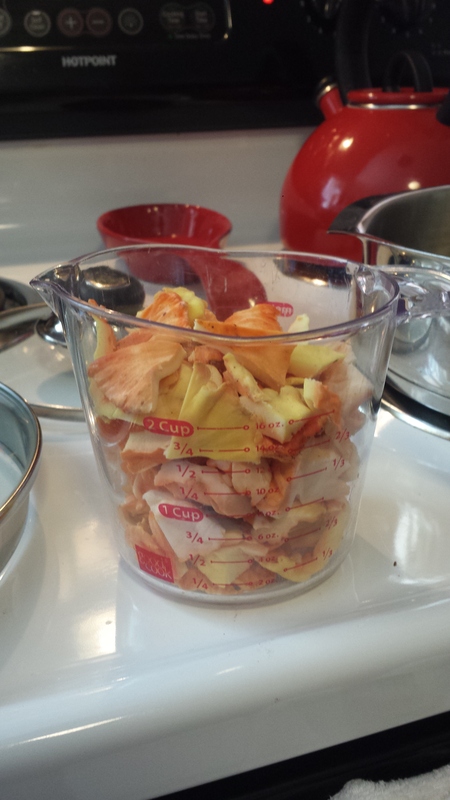 I decided to experiment with cooking methods and flavors in 2 cup increments. 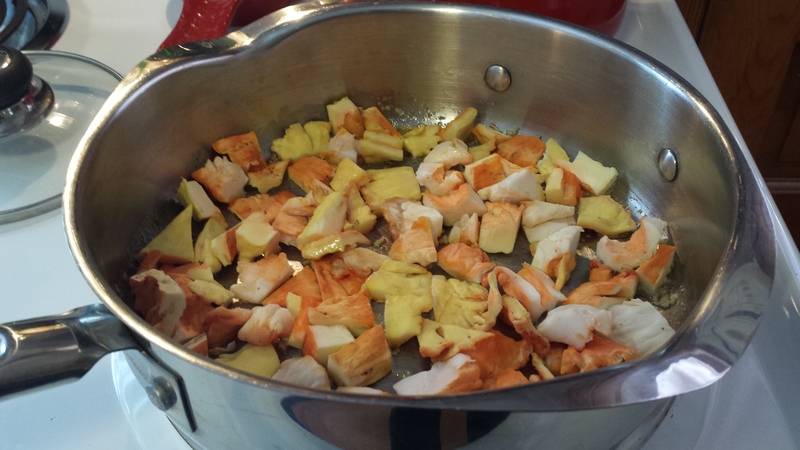 I found that it is quite absorbent, so it worked best with using less olive oil/butter. I had the best results when I sautéed 2 cups for 10 minutes (two minutes on high heat and 8 minutes on medium/low heat) in one tablespoon of olive oil and one tablespoon of salted butter. I added minced garlic and salt/pepper to taste. Once it was done cooking I added it to a marinara sauce and an Alfredo sauce which were both poured over separate pasta dishes. I highly recommend both of them! 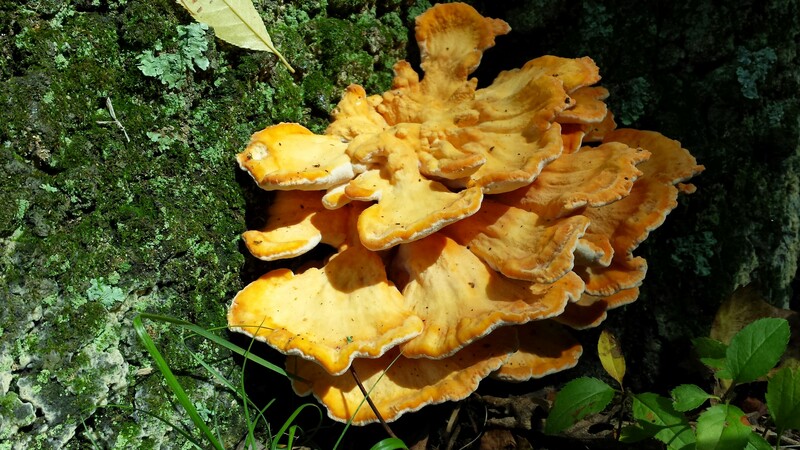 You can read more information about the various Laetiporus species on this blog.